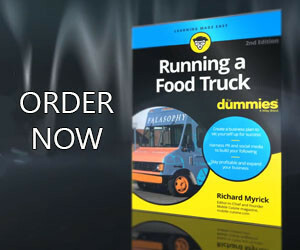 Buried inside many of the latest smartphones is a capability that few food truck owners have yet to take advantage of. A feature called tethering lets a phone go beyond talk, email and Web surfing to act as a mobile wifi hotspot that can supply Web access to nearby computers, tablets and other devices. As a food truck owner, tethering allows you to always have the Web with you without taking any extra equipment along. Like dedicated mobile wifi hotspot devices, these phones connect to a mobile data network and then act as a Wi-Fi router, distributing the bandwidth to nearby customers. There is a price to pay for the convenience that hotspot phones provide: Three of the four national networks charge an additional fee to use tethering. On the other hand, you don’t have to worry about finding a public Wi-Fi hotspot or having another device to buy, lug around, keep charged and accidentally leave behind. Tethering is the ability to share a smartphone’s Internet connection with computers or other devices. It can be accomplished by connecting the devices with a USB cable, a Bluetooth wireless link or a WiFi connection. This story concentrates on WiFi hotspot tethering because it’s convenient and can service more than one client at a time — and because just about all laptops and tablets have WiFi built in these days. How does a wifi hotspot phone work? All four national mobile data networks (AT&T, Sprint, T-Mobile and Verizon) offer phones that can act as a WiFi hotspot, and there are about 60 smartphones available today that can perform this task. They come from the major phone makers; use a variety of mobile operating systems, including Android, BlackBerry, iOS, webOS and Windows Phone; and come in a variety of sizes and shapes. At the moment, Android offers the most options, with around four dozen hotspot-capable models available. The details vary based on the phone in question, but after clicking a box to turn the hotspot on, you’ll typically need to configure it by typing in a network name, choosing its encryption type and designating a security password. Most hotspot phones are up to date with WPA2 protection so that outsiders can’t tap into your mobile network or read any data. Setup takes a couple of minutes; when you’re done, the phone is ready to be used as a hotspot. If you plan on setting up a wifi hotspot for your food truck business, consider advertising that fact on the side of your truck. This way potential customers are aware that they can get easy online access when they are near you.